Students of Western philosophy often find themselves compelled to read large tracts of perhaps the densest and most confusing philosophical work ever written - by Hegel. I have recollections of sitting with 20 or so in the last seminar series on the German philosopher by Gillian Rose, a diminutive but intellectually ferocious professor at Warwick. The seminars took place in the afternoons in the autumn of 1995, with the set text being Hegel's utterly impenetrable brick, "Science of Logic". For some reason, we didn't turn on the light, so by the end of a three hour session, we were all in darkness. The seminar proceeded by Professor Rose making some opening remarks (next to a portrait of her philosophical hero by her desk). Then, we each had to read a sentence or two and then provide an exegesis. According to Rose, the key to the book was the chapter on "Illusory Being". This chapter begins, "Essence that issues from being seems to confront it as an opposite; this immediate being is, in the first instance, the unessential." There are 800 pages of sentences like this. Looking back on my time studying philosophy, I don't think any philosopher made less sense than Hegel, not only in terms of the pure torture of his sentences, but also in terms of the logic of his thinking. 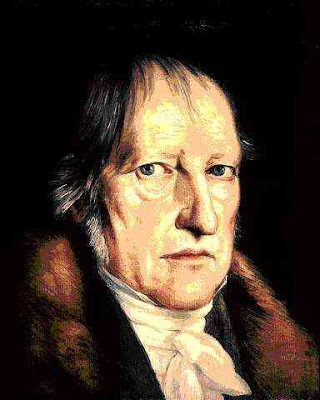 Hegel's thought boils down to the idea that there is a grand logic at work in world history, which is reflected in the developing consciousness of man. Its pure bunkum, but it does give academic philosophers something to do. It wouldn't be so bad if Hegel remained merely an academic curiosity in a dusty cabinet in one of the increasingly fewer high quality departments around the world. However, Hegel's work is not only a dense bundle of obfuscation, it also Eurocentrist and racist, as this post clearly indicates. At some point, but not yet, western philosophy and western philosophers will come clean about all the ways subtle and not that Eurocentrism and racism has infiltrated that which they teach, perhaps beginning with the erasure of Abbassid thinking and its import for "western" philosophy in the House of Wisdom. But let us place emphasis on the "not yet." The west continues to require its "others" in the present and in the past. Nice piece Jeremy. But then, there would be no sartre, nietzsche or western phil without hegel. Can you live with that? Tongue-in-cheek. but, seriously, some of the points you make reminds me of the conrad-achebe wahala--the whole western thought and its racist beginnings/sensibilities complaints. The thing is that it gets old and there is something uninteresting about complaining, but more so about complaining that someone else's archive, within which you yourself is comfortable entrenched is racist. For me o, Hegel, western phil are frankly fascinating and smart. I am more interested in how i can engage it on all grounds in relation to African lit for instance. The racism part, like achebe and conrad's saga, bores me. Me, I can happily do without Sarte and his negative ontology. Now, Nietzsche, I cannot do without. When I think of the violence of being and existence, Nietzsche returns me to us to the fundamentals - the body. Not just any body, but the body in dance... Hegel can stay and I am glad he too exists 'cause he helped us to really understand the power dynamics between the MAster and the slave. Jeremy, I know you know Hegel better than what you are presenting. Yes, yes he declare that Africans have no history, but who cares. Are we proving him wrong? What history are we producing now?